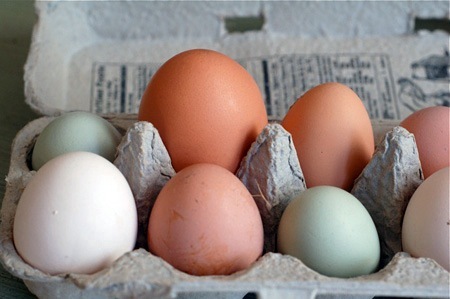 Once upon a time, hens took a break during the winter, waiting for the arrival of longer, warmers days to lay their eggs and hatch their chicks. Although we’ve entrapped them in an endless summer of egg production, it’s good to stop occasionally and remember that so many basic foods, especially the ones we take for granted, are still wonders of nature. Yes, I know. If I were truly reverent, I would be a vegetarian or a vegan or, in the end, a breatharian. But I am weak. And I love to eat. So when a dozen eggs recently made their way from a friend’s chicken coop in Petaluma to my kitchen counter, I knew exactly how I would enjoy each and every one. One of my favorite, work-a-day breakfasts is a couple of fried eggs over rice or, in the classic Saigon fashion, sunny-side up with a hunk of baguette, a drizzle of soy sauce and lots of cracked black pepper. To celebrate this week’s very special acquisition, however, I fell back on a somewhat fussy but deeply comforting dish that I make whenever I have an abundance of supremely fresh eggs. It’s a blend of techniques I’ve gathered together over the years from various purist recipes for The Perfect Scrambled Eggs. The two key trucs are: 1) a garlic clove impaled squarely on the tines of a fork and 2) a double boiler set over barely simmering water. The first adds just a hint of depth without masking the egg’s natural flavor, and the latter insulates its silken curds from the toughening abuse of direct heat. There are many ways to change this dish, but the beauty of it lies in an utter simplicity of ingredients tempered with doting attention at the stove. The usual copious amounts of sweet cream butter are, of course, de rigueur. If you’re feeling a bit more extravagant, a drizzle of truffle oil is entirely acceptable, or if you’re way more moneyed than I, you can just shave the truffles right on top. Strangely, I have never made this dish for anyone else. It’s food that I enjoy in solitude, reveling in each private mouthful, free of the distraction of conversation or the worry of entertaining or the need to share. Coordinate your bread toasting so that the slices will be ready just before the eggs are. With a dish this tender, choose a more delicate crumb and trim away the crusts. Anyone who insists on cooking the eggs until they are completely dry should not bother with this recipe. Pierce the garlic halves securely with the tines of a fork. In a small bowl, beat together the eggs and half-and-half with the fork until the whites are well incorporated with the yolks. Stir in the salt and pepper. Discard the garlic cloves. Heat a double boiler or a heavy bowl over a pan of gently simmering water; there should be only a few bubbles rising at the edge of the water. Melt the butter, then add the beaten eggs. 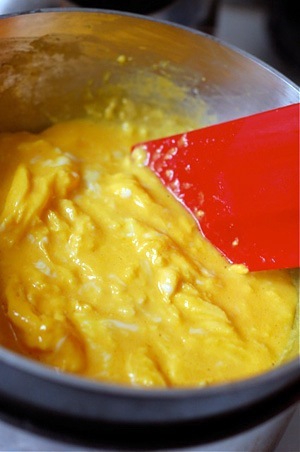 Using a rubber spatula, slowly scrap the side of the double boiler as each thin layer of egg solidifies above the rising steam. 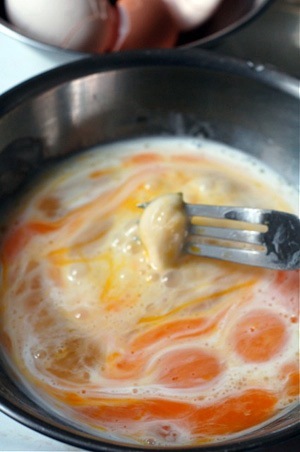 Continue gently scraping and stirring with a folding motion to preserve the silken waves of the egg curds. Be patient. 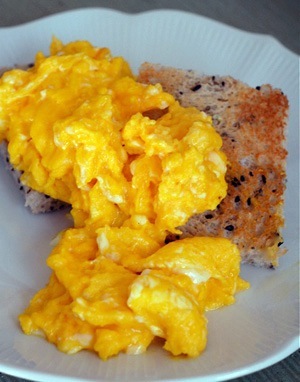 When liquid no longer pools at the bottom of the double boiler and while the eggs are still moist and shiny, quickly spoon the scrambled eggs over the waiting slices of toast. Savor while still hot. oh I love the assortment of eggs! this looks delicious, I love eggs cooked in a double boiler, the creamy texture is unbeatable…. Yummy! Those eggs are so pretty! PS: I eat scrambled eggs almost every day.